What is the Microsoft Surface Book 2? Yes, it is the successor to the first Surface Book. It is a hybrid between a tablet and a notebook. A powerful 2-in-1 convertible. You can get the new generation with 13-inch and 15-inch screen, powerful 8th generation Intel Core processors, and a dedicated graphics card. Sounds interesting? Read on to get to know the Surface Book 2. 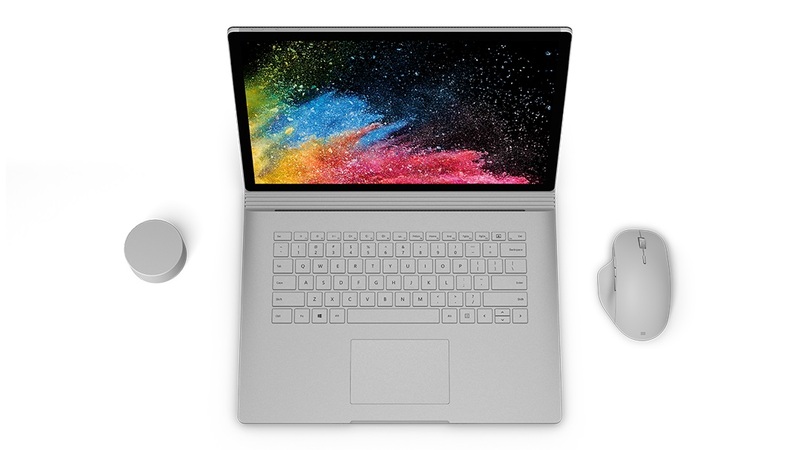 The Microsoft Surface Book 2 consists of two parts. With the attached keyboard, it looks and works like a notebook – or more like a convertible 2-in-1 notebook. But you can detach the screen and get a very powerful tablet – basically a Surface Pro. As you might expect from Microsoft, the Surface Book 2 feels very high-end. Depending on the version, we‘re getting a 13.5-inch screen with a resolution of 3000 x 2000 pixel or a 15-inch screen with an even higher resolution of 3240 x 2160. Like usual, you can draw or takes notes using the Surface Pen. The new one supports 4096 pressure points. Like mentioned earlier, the internal hardware is very powerful. Microsoft is offering the Surface Book 2 with 8th generation Intel Core i5 or Core i7 quad-core processors. With one exception. The cheapest version features an older dual-core chip. In addition to that, it comes with 8GB or 16GB of RAM and a 256GB, 512GB or 2TB SSD. To make the Surface Book 2 even more powerful, Microsoft is offering both versions with a dedicated graphics card. It’s an NVIDIA GeForce GTX 1050 which sits inside the keyboard dock. With that one, you should be able to play higher-end games at 1080p with 60fps. The Microsoft Surface Book 2 will go on sale on November 9th in the United States and many European countries. Over time, I think the 2-in-1 convertible will be available almost worldwide. As of now, prices start at pretty steep 1749 euros for the cheapest version. That varies by country though. The Microsoft Surface Book 2 is a premium 2-in-1 with very powerful hardware. Its highlights are 13.5-inch and 15-inch detachable tablets with very high-resolution screens. You can get it with 8th generation Intel Core processors and dedicated NVIDIA graphics cards.